SEATTLE, Wash.–March 23, 2010–KING FM, Seattle’s iconic classical music radio station, announced today that it intends to become a listener-supported public radio station beginning in July 2011. KING-FM has been one of the last commercial classical holdouts in the nation, but as so many other classical stations have discovered, the commercial model doesn’t work very well for classical music. The station was founded in 1948 by Dorothy Stimson Bullitt and later donated by her daughters to a non-profit corporation made up of a triumvirate of the Seattle Symphony, Seattle Opera, and ArtsFund, a grantor to the larger local arts organizations. In practical terms, that means that the Symphony and the Opera (as well as Pacific Northwest Ballet) have received the lion’s share of air support from KING. That will change with the new public sensibilities. a more financially healthy and stable station. 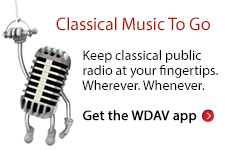 Those of you who have public classical stations in your communities may have forgotten what a commercial station sounds like. Just imagine listening to 3 or 4 stopsets an hour of the same raucous ads you hear on a rock station or on TV. Now KING will be able to keep the integrity of its sound throughout the programming. It will also free up some of the “talk-time” for helping the arts groups, who will in turn encourage their audiences to engage with the station. This will be the single biggest boost to the arts community in Seattle since the creation of ArtsFund. I don’t think people realize how powerful the airwaves are for raising the tide that lifts all boats. Congratulations, KING-FM. We’ve got your back.